Perforated Support Core or Perforated Back-Up Tube w/handle is the main internal component within the side inlet strainer housing. 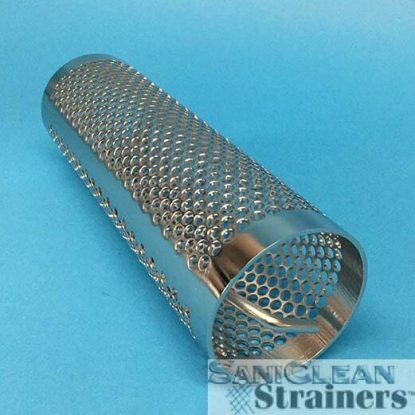 The Side Inlet Strainer Assembly can be used with the Back-Up Tube by itself for coarse separation, with a Wire Mesh OverScreen for straining (down to 74 microns), or with a Filter Sock for filtering down to 25 microns. The Perforated Back-Up Tube is punched from 316L SS sheet. The Back-Up Tube has solid edge margins at both ends of the tube, and on either side of the longitudinal welded seam. The Back-Up Tube for a Side Inlet Strainer Assembly has a handle welded to the ID of the Back-Up Tube for easy installation and removal of the Back-Up Tube from the strainer assembly. All welds are gound smooth. The Back-Up Tube is electro-polished ensuring a surface finish of 25Ra or better. All material 316L SS.